January 20th, 2006 will mark the16th anniversary of Hayedeh's passing in exile. Her songs are still loved and remain very much popular among the Persians (Iranians) but until now no one has written a complete article about her activities. This occasion encouraged me to do just that and the following is my humble attempt at such undertaking. Hayedeh, the legendary diva of Persia, was born in Tehran in 1942. Since her childhood she was fascinated by the late Persian singer Delkash's voice and it was while performing one of her songs at a party that she was discovered by Ali Tajvidi, a famous Persian violinist and composer, that noted Hayedeh's gifted voice. After studying Persian vocal music with Tajvidi, Hayedeh performed her first hit song "Azadeh" which was composed by Tajvidi on the lyrics of Rahi Mo'ayeri. Performing this work with Golha Orchestra in 1968 at Radio Tehran introduced Hayedeh's vocal talent to Persians who warmly received it. 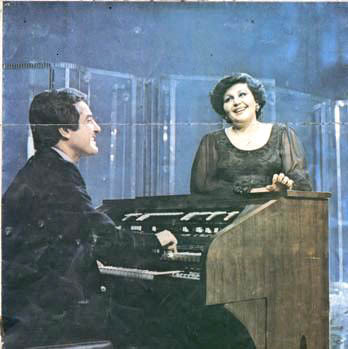 In early 1970s, along with her classical Persian songs, Hayedah also performed many pop songs composed by the likes of Jahanbakhsh Pazouki, Anoushiravan Rohani and Mohammad Heydari. "Bezan Tar", "Gol-e Sang", "Nowrouz Aamad" and "Soghati" were among her memorable works during this period. In September 1978, a few months before the revolution in Persia (Iran), she moved to England. She always called this event as the worst memory of her life. Since she had performed at some of Shah's ceremonies, Tehran's revolutionary court accused Hayedeh of promoting "Royal Music" [ Musighi-e Taaghouti] and summoned her to court in 1979. When she did not appear, she was put under prosecution by the regime. In exile Hayedeh spent a few years with her children in London and with the help of some Persian musicians appeared in several concerts there. In 1982 she moved to Los Angeles, where hundreds of thousands of Persians have settled since the 1979. In this period, Hayedeh's political and nostalgic songs, mostly composed by Farid Zoland, Sadegh Nojouki, Anderanik and Anoushiravan Rohani on the lyrics of Leila Kasra (Hedieh), Ardalan Sarfaraz and Bijan Samandar, boosted her popularity among the exiled Persian community. Among the most famous songs were "Rouza-ye Roshan Khodahafez" (Goodbye Bright Days), "Faryad" (Cry), and "Zendegi" (Life). During this period, Hayedeh regularly appeared on the Los Angeles-based Jaam-e Jam, a Persian-language TV station established by Manouchehr Bibiyan and a few other Persian artists and journalists in exile. 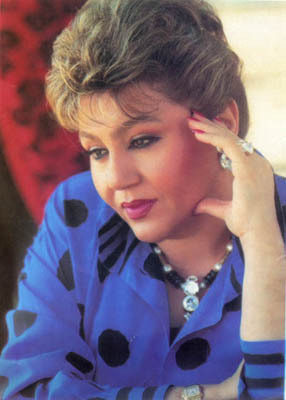 Hayedeh not only criticized Iran's fundamental regime in some of her TV programs, but also recorded more than 40 music videos at Jaam-e Jam Studio, most of which were secretly distributed in her homeland. Hayedeh also traveled twice to London and gave two concerts with large orchestra (conducted by Farnoush Behzad) at the Royal Albert Hall. She also appeared once at UCLA with a Persian instruments ensemble, led by Manouchehr Sadeghi. Prof. Erik Nakhjavani writes about Hayedeh's vocal and performative style in Encyclopedia Iranica: "Analogues to Delkash, before her, Hayedeh sang with technical authority and passionate energy. Her laryngeal control made it possible for her to produce a series of graceful vibrato and glissando vocalizations required by the Avaz [Persian voal music]. She could smoothly pass from the upper reaches of her alto voice to the lower, fuller, and darker range of the contralto. This mixture of strong laryngeal strength and learned vocal technique gave her alto-contralto voice a rare, powerful resonance and texture in the performance of the Avaz. Furthermore an acute sense for musical timing, the rhythmic flow of vocal music, affective musical phrasing, and poetic delivery enabled her to express and interpret effectively any songs she sang." 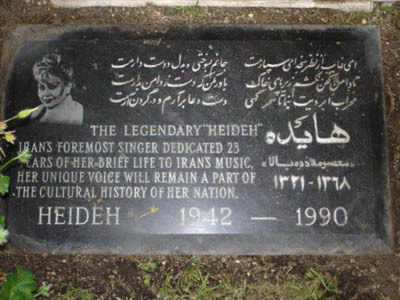 Hayedeh died from a heart attack at the age of 47, only hours after a performing in a concert at the Casablanca Club in San Francisco, where she performed most of her memorable songs for a crowd of a few hundred Persian immigrants based in Northern California. Khosrow Motarjemi, a Persian IT expert in California, recorded the event on video which was never released. On this 16th anniversary of Hayedeh's passing, her voice is ever alive and will continue to live among the Persian people. "Yaadash Geraami".